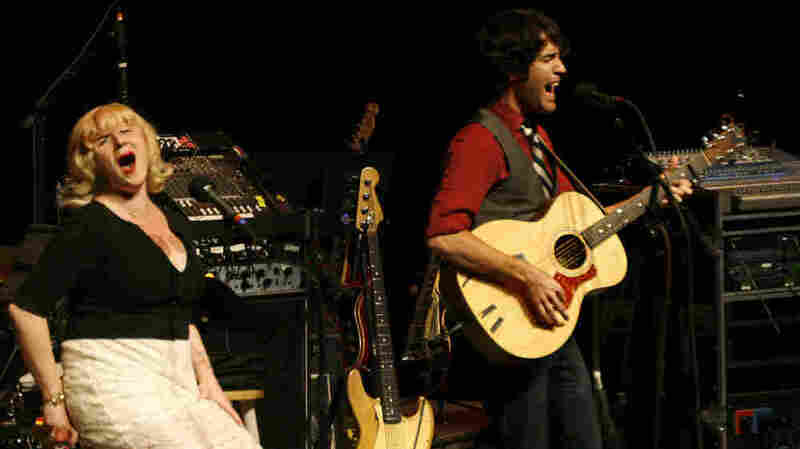 Vandaveer On Mountain Stage The duo showcases its delicate, intertwined folk harmonies with a sprightly and youthful spirit. Vandeveer performs on Mountain Stage. "However Many It Takes It Takes"
The indie-folk duo Vandaveer's first appearance on Mountain Stage, recorded on the campus of West Virginia University in Morgantown, features vocalist Rose Guerin joining singer-songwriter and guitarist Mark Charles Heidinger, who also occasionally plays bass for These United States. A handful of members of the Washington, D.C., music scene have trickled in and out of Vandaveer since its founding in 2006, but since the addition of Guerin in 2007, she has continued to become an integral part of the band's live sound. The duo's delicate, intertwined harmonies are best showcased in their final song here, the imaginative "Beverly Cleary's 115th Dream" — dedicated, it would seem, to Heidinger's inner child, Ramona Geraldine Quimby. Vandaveer's most recent release is Dig Down Deep. After Vandaveer's set, Mountain Stage band vocalist Julie Adams takes the stage with her spin on the Willie Dixon blues standard "Spoonful." This show originally aired November 17, 2011.